If you’re thinking of selling your home, you’ve likely done a fair amount of research on the different options available to you. From traditional real estate agents to new companies promising low fees and quick closings, you have more options than ever to choose from. However, not all real estate companies are created equal, so how do you weed out the ones that don’t stack up and find the ones that do? To provide you with some transparency on how Jovio compares to some of the other real estate companies out there, we’re doing a deep dive on how selling with Opendoor compares to partnering with Jovio. 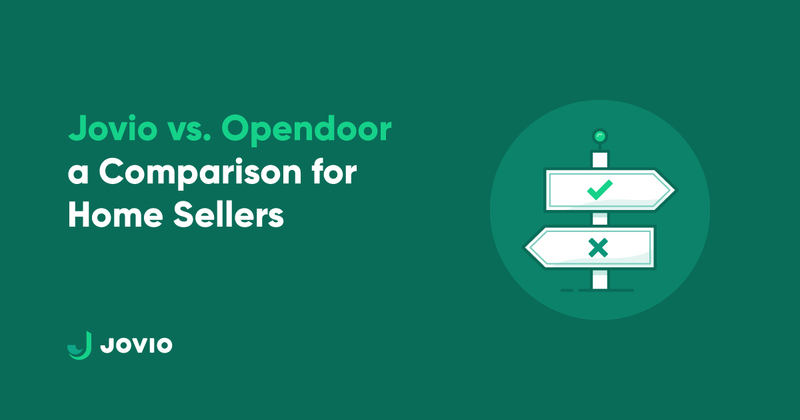 But before we dive into the differences, let’s give ourselves a refresher on how Opendoor works. Traditionally, when selling your home, you’d partner with a real estate agent who would help you price, prepare, and list your home. They’d also help show, market–and once you go under contract–negotiate, and close the deal. For this service, you’d typically pay your real estate agent a 6% commission, of which they would in turn offer half (3%) to the buyer’s agent. While this model has prevailed for decades, as technology advances and homeowners take more of a lead role in selling their home, they’ve started to question if the value they’re receiving is worth the cost. On top of the expense, the traditional process is long, fragmented, and undoubtedly causes a lot of undue stress and headaches. Opendoor attempts to reduce some of this stress by offering a fast sale and a more simplified process. How do they do this? Unlike selling with a traditional agent, Opendoor works by purchasing your home directly. They then prep it for listing and put it on the market. But once they’ve purchased your home from you, your part is done. No showings, no repairs, no buyers to deal with, and no negotiating (except with Opendoor). Sounds great, right? The only problem is, all of this comes with a hefty price tag (keep reading to see just how much of your equity you’ll need to give up). And although Opendoor isn’t all it's cracked up to be, not all hope is lost! Enter Jovio–a Texas-based digital real estate brokerage providing home sellers with a modern way to sell their home. Our tried-and-true, technology-infused process means you can sell your home faster and easier without losing thousands in equity. Aided by technology and an expert team of REALTORS®, we’ll guide you through prepping, listing, marketing, and closing on your home. Aside from that, there’s a few fundamental ways in which Opendoor and Jovio differ. Below we’ll explore some of the top motivators for sellers and how Opendoor and Jovio measure up. Whether you’re looking to move out as soon as possible or are on a tight timeline to relocate for work, there are a number of factors that might motivate you to sell your home fast. For homeowners who want more control over their timeline or simply want to sell quickly, Opendoor is an appealing option. With Opendoor, you might get a quick close and more control, but in return, you can expect a lower than market sales price. Opendoor capitalizes on the fact that you’re motivated to sell quickly. After Opendoor buys a home, they’ll typically re-list it within two weeks with an asking price 7.4% higher than they paid for it. To do this, they’ll usually invest only a few thousand dollars to modestly fix up the property. Pro Tip: Already received an offer from Opendoor and want to see how it compares? Check out our free home estimate tool to see how their offer checks out. Our home estimate relies on market data, property condition, and is always quality checked by a Jovio Real Estate Specialist. With Jovio, instead of buying your home outright, flipping it, and selling it for a higher price, we help guide you step-by-step through the process of selling your home. We’ve mastered the selling process and developed an easy-to-follow path to closing. Yes, it may require you to do a little extra prep work, but you get to reap the rewards, not someone else. With little lift, Jovio sellers can list within 24 hours. On average, Jovio sellers go under contract within 21 days of listing and close within 50 days. Perhaps you’re not looking to close quickly, but just don’t want to be bothered with the inconvenience of selling a home–cleaning the house, dealing with showings, making repairs–and the stress that goes along with it. If you’ve sold the traditional route, you know it’s no walk in the park. Although you may be tempted by Opendoor’s promise of no showings and no stress, you’ll pay a large price for this convenience. In addition to a lower sales price, you can expect to pay a service fee ranging from 6-13%. If you’re selling a $300,000 home, that means you’ll pay anywhere from $18,000 to $39,000 in Opendoor service fees. Did we mention that doesn’t account for closing, repair, and other hidden costs (more on this later)? At Jovio, we believe in maximizing the return for sellers and allowing you to keep as much of your hard-earned equity as possible. That’s why, you’ll only be responsible for paying a 1% listing fee and a $495 setup fee to get your home listed. We’re all for transparency so to cover all our bases, we’ve rounded up all the costs you can expect to pay when selling with Jovio. Aside from our seller-friendly pricing, our streamlined process and unparalleled service make Jovio a compelling alternative to other services like Opendoor. We touched on pricing a bit already, but with Opendoor, their 6-13% service fee only tells half the story. According to independent research studies, when you sell to Opendoor, you can expect to sell for around 7.4% below market value. Plus, you’ll still be responsible for paying 1-3% in closing costs. Add all these costs together, and in effect, you’ll be paying 14.4-23.4% total to sell your home to Opendoor. Conversely, when you sell your home with a traditional agent, you can expect to pay 5-6% of your sales price in total commissions (i.e. 3% to the listing agent and 3% to the buyer’s agent). In addition to that, you should expect to pay 1-3% in closing costs. Of course, there may be other expenses like repair costs and seller concessions, but those vary depending on the condition of your home and the specific transaction, and are fees that Opendoor also charges after they give you an initial purchase offer. At Jovio, we believe in straight-forward pricing and no hidden fees. That means, what you see is what you get. In fact, we go in-depth about the philosophy behind our pricing. When you sell with Jovio, you’ll pay a $495 setup fee which includes professional photography, a custom listing page, physical and digital marketing collateral, a marketing budget for digital ads, and more to get your home discovered by thousands of buyers. You’ll also pay a 1% listing fee and 2-3% in buyer’s agent commissions. All in all, you’ll end up paying a total of 4-7% (which includes 1-3% in closing costs for items like title insurance, escrow and title service fees, and HOA transfer fees) plus a $495 setup fee, which amounts to a significantly lower cost to sell than Opendoor. To sum it up, we’ve created a cost comparison chart to show you just how much you can expect to pay when selling with Jovio, a traditional agent, and Opendoor. When it comes to selling your home, choosing the right partner to help you do so can be a challenge in and of itself. Whether you’re considering a traditional agent or an alternative, making sure that person or company has your back is probably at the top of your list. A good indicator of an agent’s trustworthiness is what their clients say about them. When talking to a prospective REALTOR®, it’s always a good idea to ask for referrals from their previous clients. Don’t just go by the reviews they post on their website. Dig a bit deeper and put some time into finding out what their past clients really think. No matter who you choose to work with, it’s important to do your own due diligence. While we can’t speak for Opendoor (but we encourage you to do your own research), here at Jovio, we believe our reviews speak for themselves. Hear directly from Jovio clients like Sandy who went under contract on her home less than 24 hours after it was posted as Coming Soon and Chris and Jessica who received six competing offers within 48 hours of listing. We also encourage you to explore reviews of Jovio outside of what we have listed on our website. And if you’d like to speak with some of our clients directly, we’re happy to provide you with referrals! Another key to a successful agent-seller partnership is finding a partner that shares your goals. All agents have a fiduciary duty to act in their client’s best interest. But many of the newer real estate companies run on business models where making money is the end goal, not their client’s success. The Opendoor business model centers around this very concept. They make money from the up-charge they get when reselling your property. It’s in their best interest to buy your home for the lowest price possible so they can maximize their return when they turn around and list it on the market. The Jovio business model couldn’t be more different. Everything we do is centered around helping our clients reach their goals. When you succeed, we succeed. If you sell your home for more, we as a business make more as well. We’ve completely aligned our interests with that of our clients. In fact, it’s what our company was founded on and helping you reach your goals is at the very core of our mission to Unlock Ownership®. From understanding how much it will cost to finding a partner you can trust, there’s a lot to consider when you’re thinking about selling your home. While some real estate companies may promise quick closings and lower costs, they may not always be working in your best interest. If you’re looking for an alternative to traditional selling, we’d love to help you reach your goals faster, easier, and with more money in your pocket. Get started today by scheduling a complimentary property visit with a Jovio Real Estate Specialist or give us a call. Our Specialists are available around the clock to answer any questions you might have. Lindsey is Jovio’s marketing guru. After studying Economics and Finance at the University of Delaware, she found her true passion in marketing. When she’s not writing about real estate, she enjoys catching up on the latest Netflix series, exploring Austin, and traveling with her fiancé.